You may have heard or thought about your sales funnel stages — the different steps your customer goes through on their way to buying your product. But what do you do if your customer doesn’t even know they need your product or service? I’ve been working with a woman who does PR for the food and beverage industry. She knows that many restaurateurs could benefit from PR, but they don’t know what it is or what it could do for them. She’s considered writing content to educate people about what PR can do for them — but we wondered if they aren’t even familiar with PR, would they even click? Good content marketing is all about meeting your customers where they are. If your content only addresses one part of the customer awareness spectrum, you could be losing out on tons of potential readers, followers, and customers. You need to identify what your readers will get from your content marketing and also what you hope to gain from it. And you should tailor your content to your sales cycles to lead them down a path to your marketing goal. But there’s a third aspect to meeting your customers where they are: the customer awareness spectrum. At any given time, different potential customers have different levels of awareness of your brand, the problem you solve, and the solutions you offer. Think of this like your crystal ball. With it, you can peer into the wispy ethers of your potential customer’s mind and know exactly which message will help them move closer to a sale. 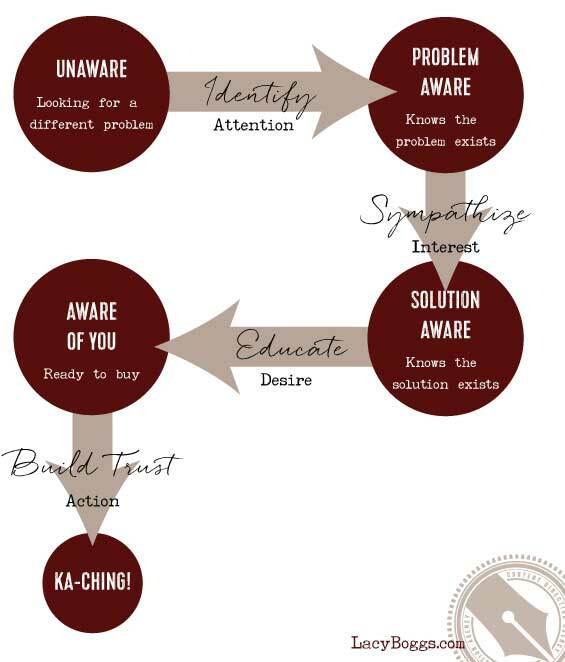 Where are your readers in your customer awareness spectrum? Even if someone is potentially an ideal customer for you, they may be in different places on the customer awareness spectrum. The spectrum covers how aware your customer is of your solution, from completely unaware that the problem even exists, all the way up to being a big fan of yours and ready to buy. When you realize that you have potential customers all across this spectrum, you can start to create content that speaks to them where they are — and tells them exactly what they need to hear. 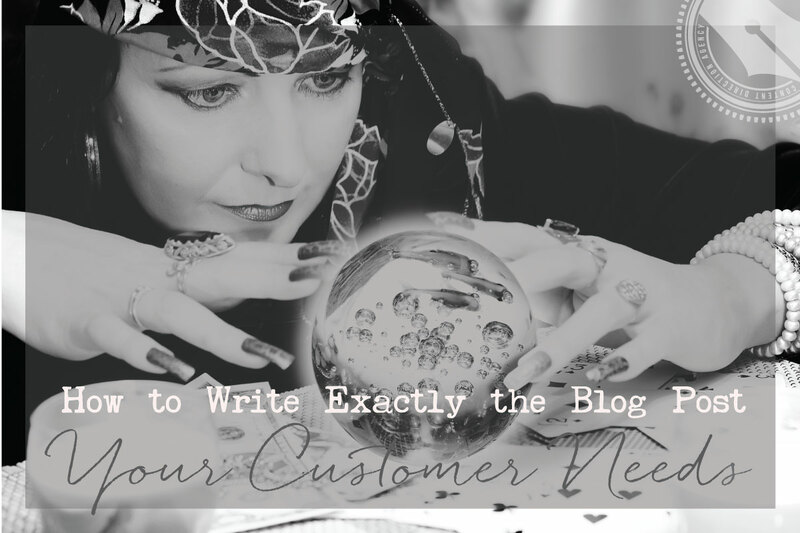 The customer awareness spectrum is your crystal ball to know what your readers are thinking. Different kinds of content for different sales funnel stages. Each stage of awareness has a different message that will resonate with those customers. In other words, it’s not going to be effective to scream “BUY NOW!” at someone who doesn’t even know they have a problem, let alone what your solution is. Each stage of the customer awareness spectrum also corresponds to a different level on the hierarchy of audiences, from people who have never even heard of you all the way to your biggest fans. You might also find you need different delivery methods for different stages of awareness. What works well as a blog post for one group might need to be an email or a Facebook ad for another. Let’s look at each of the stages of the customer awareness spectrum and the best kinds of content, types of posts, and methods of delivery for each. I’ve created a free, one-page worksheet to help you brainstorm content for every stage of the customer awareness spectrum. Click here to download the worksheet for free. People who are unaware of the problem you solve need to be introduced to the problem. They need to see themselves in a description of what’s going on in their lives. They need you to identify the problem for them. You’re going to have to grab their attention and cut through the noise with a powerful message. You have to echo their words back to them for them to recognize that they even have the problem you’re going to solve. I have actually run into this problem with my VIP ghostblogging service. Some people don’t even know that such a service exists. They need to be educated that there’s an alternative to hating their weekly blog writing hour. In the hierarchy of audiences, these people haven’t even found you yet. They’re not your fans on social media yet, but could be persuaded to like or follow you if they like what you have to say. These people correspond to the Attention posts in the AIDA sequence. Message: “Does this sound like you?” Help them recognize the problem you solve using their own words. Any medium that reaches an audience not already familiar with you. If someone is problem aware, she knows the problem exists. She may even be searching for a solution. Figure out what questions these readers are asking. What are people Googling about the problem that you solve? It’s still important to know what words they use to describe the problem, rather than the words you would use. People who are problem aware are looking for an expert who understands their plight and can help, so they are particularly convinced by someone who can sympathize and empathize with their problems. For these people, it’s important to show that you understand where they’re coming from — either because you’ve been there yourself, or because you’ve helped others through this problem (or both). In the hierarchy of audiences, these people are ready to like you or follow you on social media, but may not be ready to opt-in — unless you give them a really good reason! These people correspond to the Interest posts in the AIDA sequence. Message: “I know how you feel, because I was once just like you. Here’s how I fixed the problem.” Sympathize and show that you are an expert. Use the customer awareness spectrum for content that meets your reader where they are. Readers who are solution aware know that they have a problem, and they know that solutions exist to solve their problem. They may be at the point of comparison shopping, deciding which solution is right for them. These people need to learn why your solution is the best. I wrote a post a while back in which I outline how much you should pay a blog writer, and I went through all the options, from paying somebody five bucks on a site like Fiverr all the way up to hiring a professional like me. To date it is my highest traffic post, the one that gets the best SEO and the most hits from Google, and I think that’s because it’s reaching that audience that needs to be educated about hiring a blog writer; they know they want one, they are just looking to understand more about it. Notice that I use the words “blog writer” instead of ghostblogger; that’s because most people don’t search for the term “ghostblogger.” I’m using the words my potential customers use to search for my service. These people are the ones who are most ready to opt-in to your email list and learn more about you and your services. They also might be ready to book a consultation or discovery call. In the hierarchy of audiences, these people have already shown interest in you; they’ve liked or followed you on social media, and maybe even opted-in to your email list. These people correspond to your Desire posts in the AIDA sequence. Community stories, questions, feedback, etc. Finally, there are the people who are aware of the problem and already aware of your solution. They are ready to buy. These people need to trust you. They need to know that you’ve got their back and that your solution can help them. They’re the ones that are pushed over the edge to become customers by limiters like a shopping cart closing or there only being a certain number of products available. They like things like money-back guarantees and personal support. They are ready to take action — but they need that last little push. In the hierarchy of audiences, these people are in your inner circles. Not only have they opted-in to your email list, they may also have indicated their interest in one or more of your products. They are the MOST likely to actually buy from you at any given time. These people are primed for an Action post or email in the AIDA sequence. Blog posts announcing a product or that your cart is open, etc. In short, if you are only writing your content for people at one of your sales funnel stages, you could be missing out on a huge number of potential readers, followers, and customers. By tailoring your message — even just some of the time — to reach people at different stages of awareness, you’re ensuring that you are nurturing people along your marketing path, from encouraging new people to become aware of you all the way through to encouraging a purchase decision. Don’t forget: I made a really spiffy free worksheet that puts this entire formula for writing to your customer awareness spectrum on a single page for you. You definitely want this in your blogging toolkit! So fill out your info below to download it for free. Got questions? I’ve got answers. Let me know in the comments below. Was this a helpful framework for you to think about your content marketing message? And pretty please with sugar on top: if you found this useful, use one of the buttons below and share it with your social network. They’ll thank you as much as I will! Fantastic post, and super helpful! Nice post, thanks. Good points. I like your perspective. this was a really helpful reminder about talking to where your potential client is in their journey to find and hire you! Your unique style is very engaging.